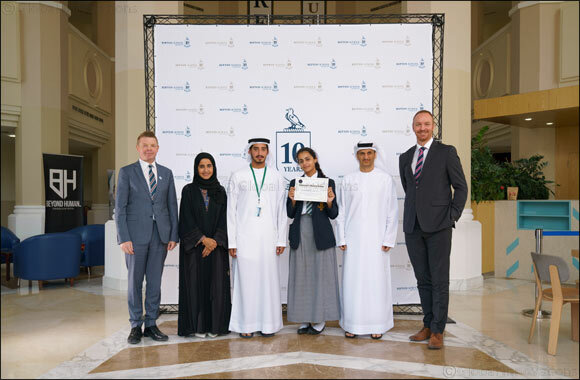 Dubai, United Arab Emirates (November 28, 2018): A Repton School Dubai student, Athija Obaid Mohamed Jaber AlMheiri, has achieved the highest score in the world for her Arabic GCSE and has received a Commendation from the Chairman of the Board of Governors of Repton Dubai, Khaled AlMheiri. EKI is the holding company of the Repton family of schools which incorporates Repton Dubai, Repton Abu Dhabi and Foremarke School. Athija achieved an overall score of 300, the highest mark attainable, and was recognised in a special ceremony to commend her hard work and efforts, which was also attended by David Cook, Headmaster and Timothy Hollis, Head of Senior School, as well as her family.